Verbena is a lovely garden plant. It has strong square stems with grey leaves and spikes of purple/violet flower heads all the way through the summer from June to October. It grows to a height of 100 –150cm and looks great in a country garden, wild flower garden or middle of a border. These plants attract butterflies into your garden. They are good for including in flower arrangements. 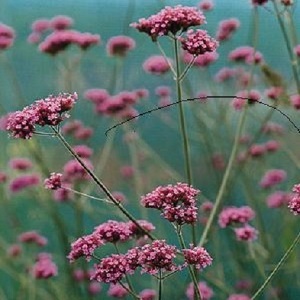 Verbena prefers full sun and moist, well composted and well drained soil. Plants self-seed in the right conditions. Pack of approx 1000 seeds. Sow anytime depending on how your sow. These seeds germinate better if chilled. Expect erratic germination, and you get plenty of plants over time. Winter/early spring sowings flower in the first year. Sowing instructions and a colour photo are printed on the packet. 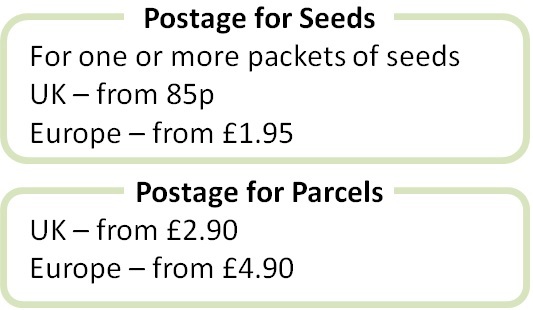 Sow These seeds germinate better if chilled. So sow in autumn, cover the tray, leave in a coldframe over winter, and seeds start to germinate in spring. Or sow anytime, place the seed tray in a fridge for 2-4 weeks, then move to 20 degrees Celcius and germination starts after a few weeks up to a few months. Chilling seeds is not essential but does improve germination. Expect erratic germination, and you get plenty of plants over time. Grow Cut back dead flower stalks in autumn. Plants die back in winter and start re-growing in spring. Plants otherwise need little attention. They self-seed in the right conditions, but not invasively.